You're eligible if you are a foreign tourist visiting Japan from abroad for sight-seeing, under the entry status of"Temporary Visitor". "Temporary Visitor"entry status, according to Japanese Immigration Law, allows a stay in Japan of 15 days or 90 days for "sight-seeing, etc." If you apply for a "stay for sight-seeing" when you enter Japan, entry personnel will stamp your passport as"Temporary Visitor,"as shownhere. Only people who have a passport bearing this stamp can use a Japan Rail Pass. 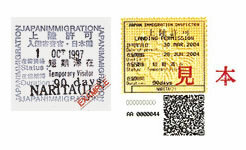 IMPORTANT:Even if you visit Japan with an Exchange Order, to be turned in for aJapan Rail Pass, the exchange cannot be made unless you have"Temporary Visitor"status: if you enter Japan under any other official status, such as "Trainee," "Entertainer," or "Reentry Permit," you cannot change the Exchange Order for aJapan Rail Pass. Please note that according to strict interpretation of the Japanese Immigration Law,"Temporary Visitor"status differs even from other types of stays that are also for only short time periods. It also allows for unrestricted boarding and unboarding, within the designated area of the following trains operated by West Japan Railway Co. (JR West): NOZOMI, HIKARI and KODAMA Sanyo Shinkansen super express trains, HARUKA limited express trains, ordinary cars of local trains (both reserved and free-seating) and the Miyajima ferry line in Hiroshima. In cases of reserved seats: A reserved seat can only be used by receiving a reserved-seat ticket (at no extra charge) at a ticket office located at stations of the West Japan Railway Co. before boarding the train. Sanyo-San'in Area pass is valid for unlimited travel in the valid area on the map. * Reservations must be made 1 month in advance.